Well, July is almost here and that means the kids need new Independence Day outfits. I have BIG plans for coordinating outfits boy and girl this year so stay tuned to see them. As soon as I'm done with crafts for Girls Camp I'll be able to get right on them. Until then I thought I would show you Maggie's 4th of July dress I made her last year. Maybe it will help give you some inspiration for your own dress. It looks kind of like a rocket pop don't you think? I thought the name was fitting. Wanna' know how I did it? It's simple and it cost me nothing to make because I just cut up old clothes. The red part is the top of a pair of red check pajama pants that were 2 sizes too big for Maggie. I cut them off just above the crotch like I did HERE. I then cut up a white shirt and made one long strip of wide fabric. I gathered it and sewed it around the bottom of the red pants. I then cut up a blue striped shirt and added another layer and hemmed the bottom. The trick is to make sure each strip of fabric you add is longer than the last. That's what gives it the fullness. 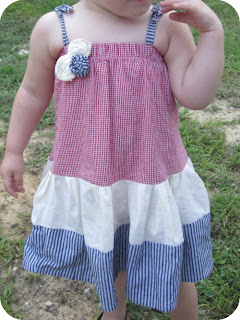 I then attached ties that I made from the blue fabric and added some fabric rosettes to the top. Easy peasy. The whole thing took less than an hour to make and was a super cute way to celebrate in the hot Alabama summer. Doesn't everything just look good when it's in red, white and blue? i LOVE this dress! i'm excited to see what you come up with this year for boy and girl.....since we both have both!!! Oh my cuteness!! This amazing Alicia! Wow! You are amazing! 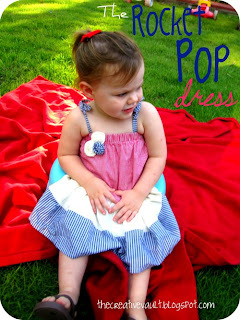 What a cute dress! I bet Maggie loves her new wardrobe! A Dinosaur of a Shag Rug!